D.1-5) Read the following information and answer the given questions. Total number of Airplanes is 300000. Out of the total airplanes some airplanes are inaccessible. Q.1) what is the difference between the total number of airplanes in India and the total number of airplane in Kenya? 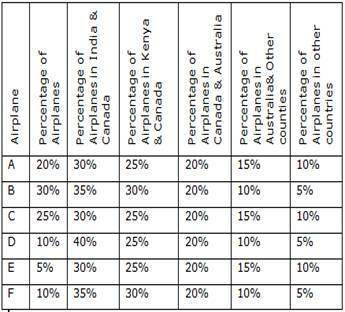 Q.2) Number of airplane E in Kenya and Australia together is what percentage of the number of airplane F in INDIA? Q.3) What is the ratio between the number of airplane C in Kenya and the number of airplane D in INDIA? Q.4) what is the total number of airplanes in Canada? Q.5) The number of airplane B in INDIA and Australia together is what percentage more than the number of airplane C in same countries together? D.6-10) Read the following information and answer the following questions. 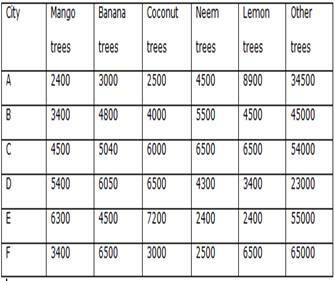 The following table shows the number of different varieties of trees in various cities. Q.7) what is the difference between the total number of trees in city C and the total number of trees in city D? Q.8) The number of Coconut trees in the city E and city A together is what percentage of the total number of trees in the city B and city E together? Q.9) What is the total number of trees in various cities? Q.10) If 10% of coconut trees in each city is destroyed, then what is the total number of remaining coconut trees in various cities?